Please follow the instructions below for assistance setting up a My Passport Wireless Pro. Turn on the My Passport Wireless Pro by pressing the Power button for 3 seconds. Wait 30 seconds to ensure the hard drive and Wi-Fi lights are illuminated, then the device will be ready for use. 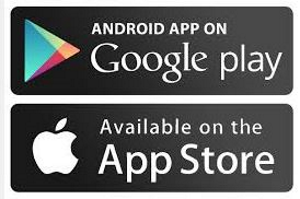 Download the My Cloud mobile app from Google Play or the App store. 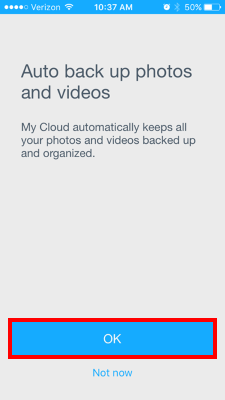 For further assistance, please follow Answer ID 10462: How to install the My Cloud Mobile App on Android or iOS. 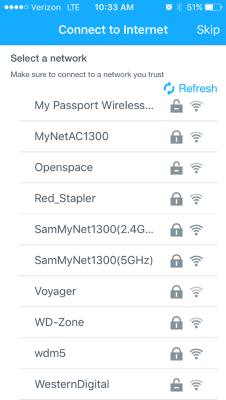 Open the wireless preferences on a mobile device and connect to the My Passport (5 GHz) wireless signal for better Wi-Fi performance. Both GHz bands are enabled by default. Some mobile devices may only display the 2.4 GHz band. 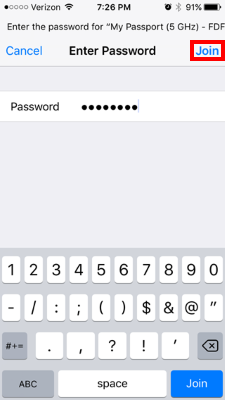 Enter the unique default Wi-Fi password located on the device and tap Join. 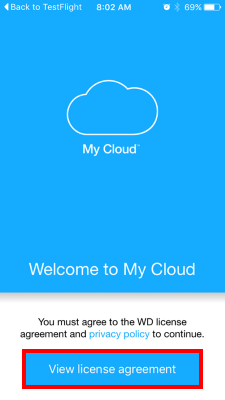 Open the My Cloud mobile app and tap View license agreement. 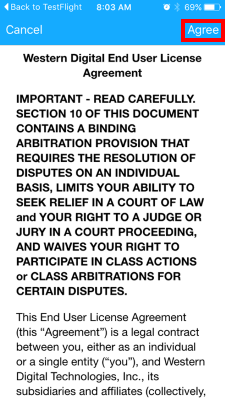 Read the license agreement and tap Agree on the top right of the screen. The application will automatically detect the My Passport Wireless Pro. If it does please skip step 10. If the My Passport Wireless Pro is not detected, please verify that the mobile device is connected to the My Passport Wireless Pro by following Step 3. 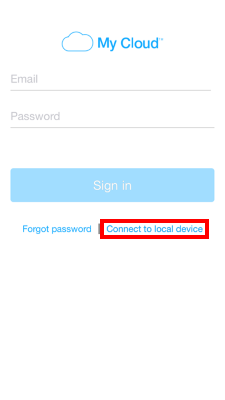 To manually connect to the device, tap Connect to local device below the Sign in button. 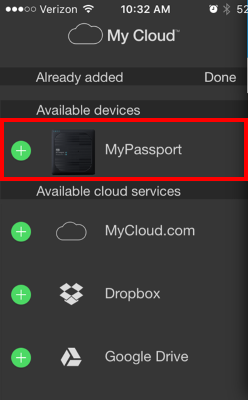 Select MyPassport located in the Available devices list. The My Passport Wireless Pro will then check for local Wi-Fi connections to connect to the internet. Connecting to a 5 GHz band is recommended over the 2.4 GHz band for better performance. Connecting the My Passport Wireless Pro to the internet will ensure that the device stays up to date with important firmware releases. 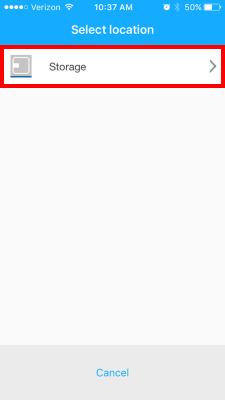 Tap on the desired network for the device to join. 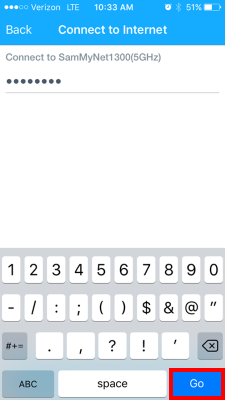 Enter the password for the Wireless Network if required and tap Go or the Enter key. 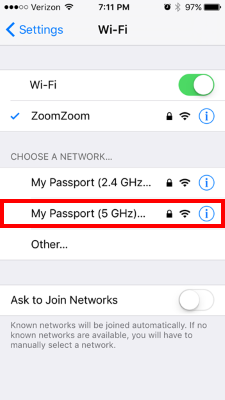 The My Passport Wireless Pro will then connect to the assigned network. Register the My Passport Wireless Pro by typing in the required information and tap on Continue. After registering the My Passport Wireless Pro, a backup and update screen will appear. Here an SD card and a USB device can back up automatically to the My Passport Wireless Pro once inserted or connected if switched on. 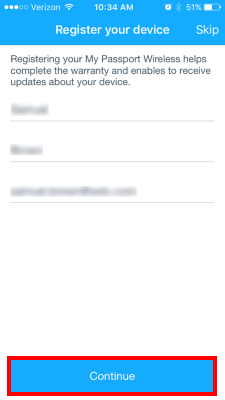 The option to allow automatic updates can also be configured. 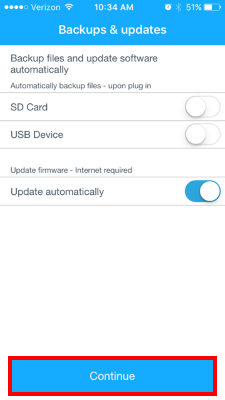 The automatic firmware update option is enabled by default. Connecting the device to the internet will ensure that it stays up to date with important firmware releases. 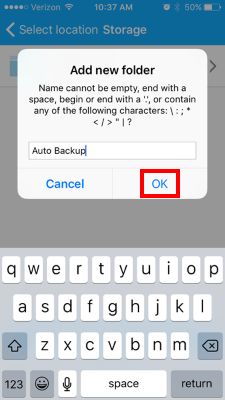 Then on the next screen tap OK to configure the automatic backup or tap Not now to finish the setup. To select a location, tap Storage. Tap on New folder on the bottom left of the screen. Give the backup folder a name and tap OK. 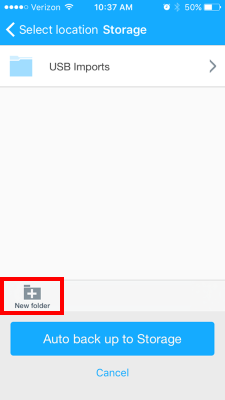 Select the recently created folder and tap on the Auto back up to 'Folder Name' button. 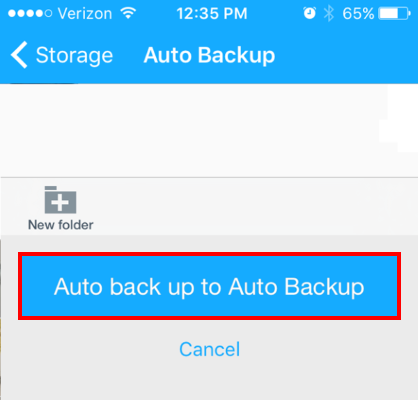 The backup should start to take place as soon as an SD Card or USB device is detected.